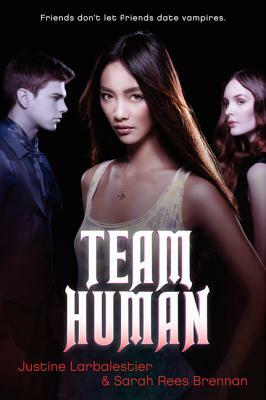 Readers who love vampire romances will be thrilled to devour Team Human by Justine Larbalestier and Sarah Rees Brennan. Team Human celebrates and parodies the Twilight books, as well as other classics in the paranormal romance genre. And Mel is equally determined to prove to her BFF that Francis is no good, braving the city’s vampire district and kissing a cute boy raised by vampires as she searches evidence in this touching and comic novel. The authors both uphold the conventions of the contemporary vampire romance and comment on it. Smart and entertaining. Themes of honest friendship and freedom of choice mix with zombies, accidental romance, a diverse and complex cast, and sharply funny dialogue to create a thoroughly enjoyable read with a core of unexpected depth. Team Human is both fearsome and funny, a fresh entry in the popular genre. A witty, comedic parody that adds a fresh idea to the teen vampire novel trend. The perfect blend of humor, heart, brains (braaaaaaaainssss?) and thrills. A witty story of friendship that has a poignancy that is rare, coupled with a dry humor that is truly laugh-out-loud funny. Funny, scary, touching, and thoughtful in ways you’d never expect: if you love vampire books, this is the book for you—if you hate vampire books, this is also the book for you. No matter what team you’re on, there are characters here you’ll cheer for. Suspense, humor, and romance: Team Human has it all! Incredibly fresh and original—and absolutely charming. I could not be more a fan of this book than if I had a TEAM HUMAN cheerleader outfit ... brilliant, funny, sharply emotional!